STARTING A NEW SPORT AT AGE 46, BMX RACING! Since I stopped competing in Natural Bodybuilding I have always missed competition. As time went on, as-well as my age, I started to think it may be too late as any sport I enjoyed, athletics for example, wouldn’t really be possible due to knee and shoulder problems. I didn’t really want to believe that though, there must be a sport that I can compete in and be competitive! I looked into various sports but I didn’t have any passion for them, when I have that passion for something then I know I will give it my all, 100%, no less. I had already got back into BMX riding 3 years ago, a sport I have always loved since the early 1980’s, even when bodybuilding I still followed the sport, although not riding much myself. I started riding skateparks and ramps again and i’ve loved every minute of it! The feeling of being on my bike is a feeling that I crave. The best thing though is that there’s a massive over 40’s riding scene. Freestyle BMX isn’t something that I’m amazingly good at though, but it’s something that I love immensely. An added bonus is the fitness side, it’s pretty much like interval training, you ride for a couple of minutes, have a short rest, then go again. But I needed that competition still…. Ever since I discovered BMX back in 1982 I have loved watching and reading about BMX racing. It’s fast, exciting and spectacular to watch. 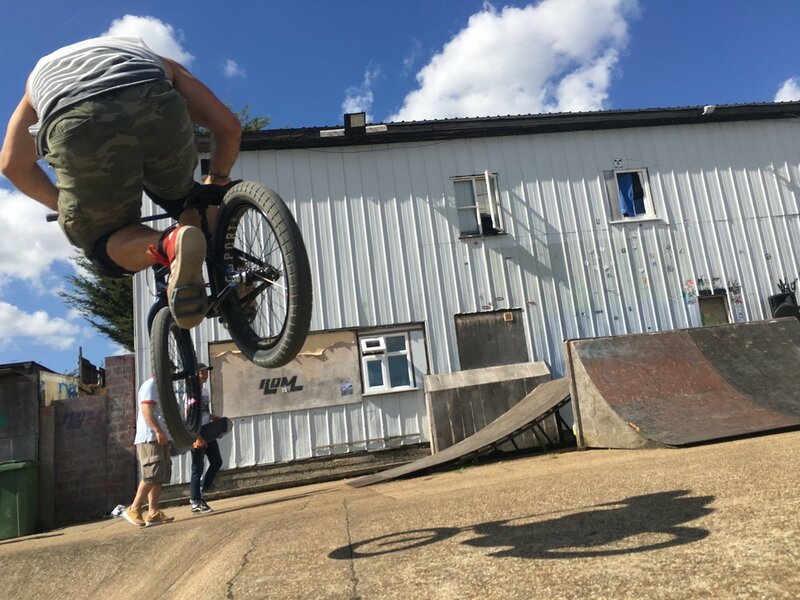 I was always too shy to start racing when I was younger as I didn’t know anyone that raced, everyone was into the freestyle side of things, which was fine and that’s what I done, spending most of my days riding over the very famous Rom skatepark in Essex. Fast forward many years to the present day and here I am, a big boy that can now do things on his own! Late last year I bought a BMX race bike, a stunning piece of kit that I couldn’t wait to use. I contacted my nearest race club and they said they would put me on the mailing list to inform me of the training times. Well, I booked myself onto the INTRO TO BMX that everyone has to do. I was told there was a few over 40’s that race at the club so I would’t be the only one. I turned up and to be honest I was a bit nervous, not because of the riding but because I would’t know anyone! Well I needn’t have worried as everyone was really friendly and the first guy I spoke to was 50 years old, so I felt ok! Well, the intro bit took all of 2 minutes as they could see that I could ride ok so I was straight into the training session. I had no idea what to expect! After a couple of laps to warm up and a few jumping jacks we had a short ‘core’ session, planks etc and then onto walking lunges and bodyweight squats, I now know how my clients feel when I train them! What followed was some sprints on the bike, some starting gate practice and skill lessons on manualling (basically a wheelie without pedalling) over some jumps and some crash training. I loved it! Feedback was good as I was told that they would of never thought I’d never raced before so that really boosted my confidence and one of the guys there thought I was hiding something as I could ride my bike well lol. They are a really good crowd. So after the training session I drove home with a big smile on my face knowing I had made the right decision, starting a sport that I know that i’m really going to enjoy. It’ll take time building my fitness and skills but I can’t wait for my first race! My bike after just getting home form my first ever BMX racing training session. I will continue a blog on here too as I know there are a few over 40 people that look at this site thinking that maybe the time has past to follow their passions. Well, it is never too late to follow a passion or to have fun! With some good training and healthy eating you can do whatever you want! Go on, go for it….